Want to persuade someone? Give them three reasons for your beliefs. Want to entertain someone? Tell a rousing story with threes (three characters, three conflicts, etc). Want the audience to remember the point? List three points of information. Why? 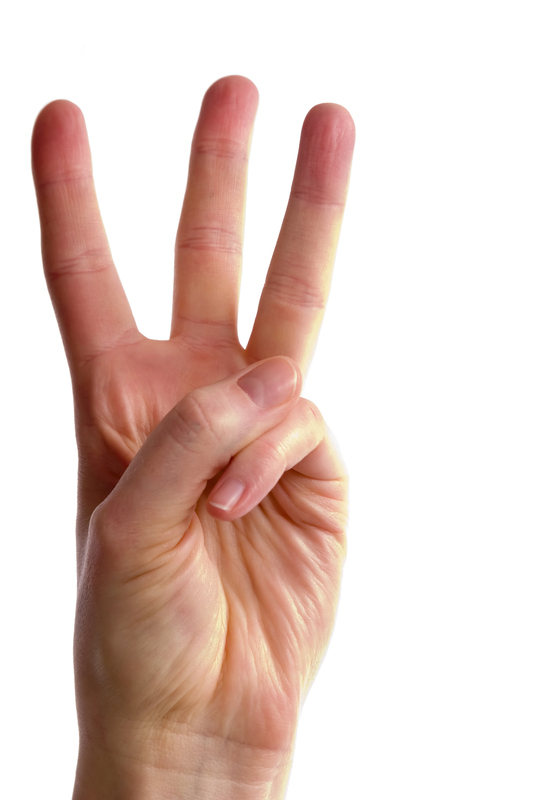 Studies have shown people remember things that come in threes. Slip in a fourth and we lose them altogether. Many stories present information in threes: The Three Little Pigs, The Three Musketeers, The Three Stooges, and even three ghosts of Ebenezer Scrooge. Photography follows the Rule of Thirds. There are three medals awarded during Olympic competitions. The power of three’s is so prevalent we often don’t even notice it, but God knew the power of three long before advertising companies or story-tellers could identify and define it. After all, He presented us with the Trinity, Three Wise Men, three rooster crows, three days in a whale’s belly, and three days in a tomb. While these are all easily identifiable, I discovered another three tucked into the book of Joshua. Chapter 1 repeats “be strong and courageous” three times within the span of a few verses. God knew the power of his words in three’s would be enough to get Joshua through the next 20 years of battle. By the time God was finished with his “talk” with Joshua, I’m sure Joshua felt the power of those three encouragements. He stood ready to do all that God had commanded. Aside from the power of three God uses strategically with Joshua, I find it interesting that he uses two words that seem much like synonyms: strong and courageous. Looking a little closer,however, I realize those words are synonyms at all. Courage speaks to taking up the task while strength focuses on staying with the task. When God gives us a directive — that can be a million different things for each of us –, we must find the courage to take the first step toward that directive. And after that first step, we need strength to continue on the path to which He has called us. Sometimes it’s easier to take the first step on an exciting new journey with God, but the perseverance to stay the course is DIFFICULT. Other times, it’s daunting and seemingly impossible to take that step of obedience into something new because we cannot see how it will turn out or it’s too hard to let go of the old and move into the new. Either way, we can take heart in the same words that God spoke to Joshua. Be strong and courageous! Take that step that God has been calling you to. Continue to walk in the path God has placed your feet upon. Always knowing that He will be with you wherever you go. He designed the past, guides today, and knows the future. That’s a “power of three” that can give each of us courage and strength to do whatever He commands. What journey has God called you to take that needs Joshua’s reminder to be strong and courageous? This entry was posted in Faith Builders, Spiritual Encouragement, Using Scripture on September 28, 2015 by aliciachall28.